Product prices and availability are accurate as of 2019-04-20 18:15:23 UTC and are subject to change. Any price and availability information displayed on http://www.amazon.com/ at the time of purchase will apply to the purchase of this product. This refractometer is for measuring the sugar content of beer and includes an automatic temperature compensation of 10 - 30 degree Celsius. This refractometer can replace your hydrometer for easier and more accurate measurements. Simply use the dropper to take a sample of wort and put it on the prism. Then hold the refractometer up to the light and look through the eyepiece. Due to the dual scale there is no need convert to specific gravity as the scale measures both Brix and SG. Comes in a hard carry case with a 1 year warranty. Please check out other refractometers available from Agriculture Solutions LLC, custom ranges available on request. 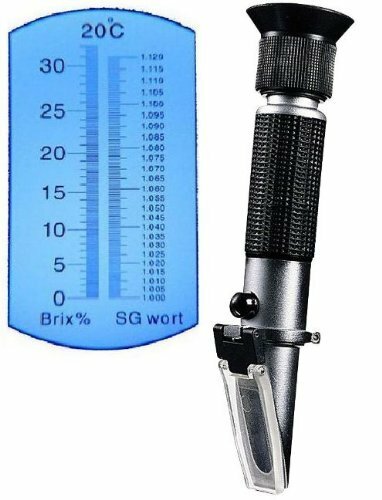 Ade Advanced Optics-Dual range refractometer measures the Brix and Specific Gravity of your Wort or wine. A refractometer is easier and more accurate than a hydrometer for measuring sugars. Features ATC (Automatic Temperature Compensation) for accurate readings. Measures Brix: 0-32% and Specific Gravity:1.000-1.120 2 Years warranty with Sportswarehouse - Do Not Buy From any other vendors, they are selling single scales with no warranty with us!